Bloomberg reports that investors believe Daimler, the parent of Mercedes-Benz, is basically worth half as much as BMW. Market capitalization at BMW — the stock price times the number of outstanding shares — has surged to 45 billion euros ($58.8 billion), versus 42.2 billion for Daimler. After backing out the value of Daimler's heavy truck business, Bloomberg says the value that investors assign to Mercedes passenger cars stands at about 25 billion euros. Just two years ago, Daimler had a market gap that was 15.6 billion euros higher than BMW. The gap comes a year after Daimler CEO Dieter Zetsche, whose contract expires at the end of 2013, vowed to regain the top spot among luxury carmakers, which Mercedes gave up in 2005. Why is Daimler worth less? For one thing, it has been less aggressive in China, it has not been as successful in the compact SUV market, and its image is less hip than BMW's among younger buyers. There's another issue, too. BMW is able to earn more selling cars than Daimler can selling cars and trucks, according to Bloomberg. That shows Daimler's strategy to have a foot in both the industrial and luxury camps may be hedging its bets at a time when it should be focusing solely on luxury. Meanwhile, in other Mercedes-related news, Reuters reports it is doing battle with Honeywell over the safety of its coolant. At stake is not just a lucrative business for Honeywell and its partner DuPont Co., who have invested hundreds of millions of dollars to develop, market and produce the coolant known as HFO-1234yf. Their refrigerant also happens to be the only product of its kind that meets new EU climate guidelines. Refrigerants aren't usually the stuff of controversy, according to Reuters. But in August, Daimler engineers tested HFO-1234yf. They simulated a leak in the air-conditioning line of a Mercedes B-class, releasing a fine mixture of refrigerant and A/C compressor oil, which sprayed across the car's turbo-charged, 1.6-liter engine. The substance caught fire as soon as it hit the hot surface, releasing a toxic, corrosive gas as it burned. The car's windshield turned milky white as lethal hydrogen fluoride began eating its way into the glass. "We were frozen in shock, I am not going to deny it. We needed a day to comprehend what we had just seen," said Stefan Geyer, a senior Daimler engineer who ran the tests. Meanwhile, Honeywell and DuPont are in full-blown damage control mode, with Honeywell creating a Web site to give its side of the story. The companies say the tests did not reflect real-world conditions, and say Daimler has exaggerated the dangers. The San Antonio News-Express reports there are some new vehicles prowling the central Texas city. San Antonio has joined the rapid bus transit trend. VIA Metropolitan Transit began operating its first dedicated bus lines this weekend. They're sleek, elongated buses that run on compressed natural gas. Mayor Julian Castro says the system, which provides shorter wait times, free Wifi and other amenities, ill improve the quality of life for early risers who are "the life blood of our city" and encourage more people to ride transit, he said. The rapid express buses are running from the city's South Texas Medical Center to a series of stops. San Antonio joins Cleveland, Las Vegas, Los Angeles, Pittsburgh and a host of cities around the world to give the mini-tram systems a try. The Economic Times reports Volkswagen is raiding companies in India for automotive talent. It is said to be hiring three executives from companies like Maruti Suzuki and Hyunda, as its beigekrieg expands to South Asia. That's in addition to two other rival company executives who've already joined the German automaker in India. VW was late to the market there, and while its sales initially boomed, it's suffered some setbacks that have prompted it to reorganize its operations and adjust the price of the Polo and Vento. Everything VW does is under a spotlight these days, as it challenges Toyota for the No. 1 spot in the world car market. 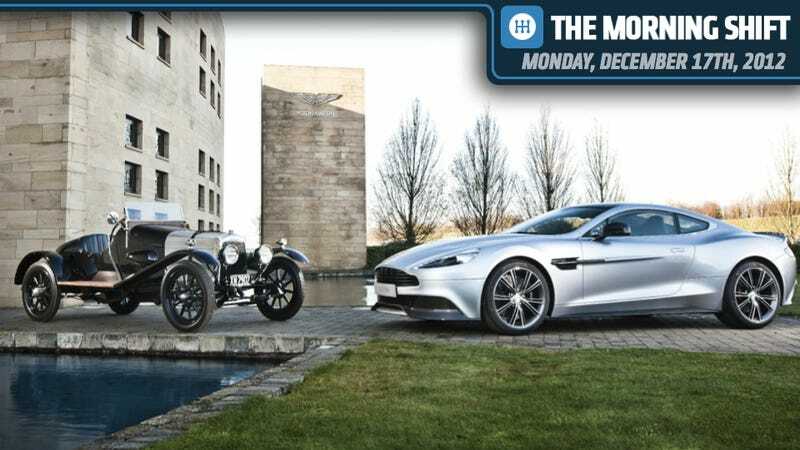 Technically, Aston doesn't celebrate 100 years of building cars you can't afford until January 15th, which is the day that Lionel Martin and Robert Bamford incorporated automaker Bamford and Martin. However, they quickly changed it to the more familiar Aston Martin after the latter won the Aston Clinton Hill Climb in one of their cars. For the first 90 years of the company they only built fewer than 15,000 cars. The recently re-re-acquired company will probably have to do better than that over the next 90 years if they want to stay in business, but they're off to a pretty good start. The announcement of the centenary was to let us know that many, many parties are coming. If you're near Gaydon check out the festivities for us next year. Today, we'd like to know if you've ridden on any rapid transit buses. Are they efficient? Do you want to see your city install them? Remember there's no right answer or wrong answer. It's Neutral.